AUDIO EQUIPMENT: Audio has been a passion of mine ever since I was a teenager, when I built my first Stereo system. In the early 70s, I started working for several local sound companies - repairing stuff, designing and building equipment, and learning the sound reinforcement business. In the mid/late 70s, a friend of mine and I started a small sound company that focused on traditional acoustic music. We did this for the next 15 years, doing lots of local concerts and small festivals in the New England area. Much of the equipment that we used was custom built out of necessity - there was just not a lot of appropriate stuff available at the time. I therefore designed and built and modified mixers, processing equipment, snake systems, speakers, amplifiers, direct boxes, press feeds, intercom systems, cases, and lots of other stuff. Most of the equipment is gone now, but I still have a couple of small systems that we use for our dance gigs. The picture on the right is a stack of 3 mixer/ amplifiers sitting on a stereo amplifier. The six channel mixer/amp (2nd unit from the top) is now about 20 years old, and is the mainstay of my small dance sound system. 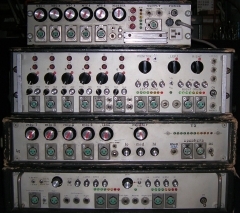 The picture on the left is an assortment of portable tools (top row) and DIs and press feeds (bottom row). Although audio is not primarily what I do these days, I still love doing the occasional project. 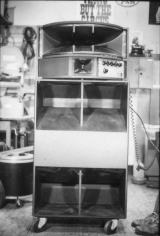 MUSIC AMPLIFIERS: In the mid 1970s I built a custom bass amplifier for a local bass player - the first of many musical instrument projects. It was buit around an EV Sentry IV speaker system and a Crown D150 amplifier with a custom built preamp - with 300 Watts of power and an extremely efficient speaker, it was pretty loud! Over the next 10 years I went on to build many guitar effects devices and pieces of stage equipment for Aerosmith, as well as occasionally traveling with them to some of their larger gigs to help sort out technical problems. I also built quite a few other devices (piano pickup preamps, harmonica microphone preamp, bass preamp) for local musicians. Some years later I built a small mixer/amp/speaker that we now use as a piano amp for our dance gigs where we have to take an electronic keyboard. DATA COLLECTION AND CONTROL SYSTEMS: In the mid/late 1980s, I started doing work for TERC on their MBL (Microcomputer Based Lab) project and was introduced to the wonderful world of computers and embedded processors. I began with the design and implementation of lots of different kinds of probes (temperature, humidity, light, sound), and then learned how to write programs (on the Apple ][) to connect to these probes and display their data. I later became involved with TERC's 'Playground Physics' project, an attempt to introduce math and measurements into kid's playground activities. For this project I designed and built a large digital stopwatch and a 'light track' (a running track that is paced by lights) - both controlled by PIC embedded microprocessors. Later, working for the for the Concord Consortium, I designed more probes using PICs and more software (this time on the Mac). Other projects that I have done include an Electroporation controller, stepper motor drivers, controls and a datalogger for a home heating system, a candle 'flicker' simulation module, burglar alarms, and control systems for various kinetic sculptures. TEST EQUIPMENT: In order to design and build electronics, it is quite useful to have an assortment of test equipment at one's disposal. 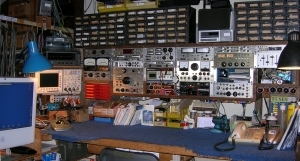 Over the years I have constructed lots of test equipment for myself and others - including signal generators, oscillators, pink noise generators, an adjustable pulse generator, adjustable DC power supplies, adjustable AC power supplies, a frequency Counter, precision audio attenuators, bench test amplifiers, audio preamplifiers and signal routing panels, stereo dummy loads, cable testers, an acoustic polarity indicator, a loudspeaker tester, and signal level meters (see the picture of my bench). DESGN and CONSTRUCTION OF PROJECTS: Over the years I have become fairly adept at both analog and digital circuit design, and often end up combining them in the same project. Any design has to be realized to be useful, of course, and so I have had to develop construction methods for my projects. The first step is to specify what the project has to do, and what physical form it should take (there are many convenient housing and front panel options, depending on functionality and appearance expectations). 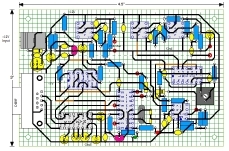 I then design the project's circuit, and make a drawing of the circuit board layout in a drawing program that shows the parts on one side, and the wiring pattern on the other side (see example, upper right). This drawing can then either be sent out to be made into a printed circuit board, or can be used as a guide for constructing the circuit on perfboard (see example, lower right). The assembled board is then mounted in a case for testing and final use. I have used this methodology for building portable equipment that is meant to be taken outinto the world and used a lot, as well as for bench test equiment and prototypes - this has worked very well for me, as many of my projects are still in active use after 30 or more years. COMPUTER PROGRAMMING: Since the mid 1990s, I've been spending more and more of my time writing software for the MAC - I use the FutureBasic language from Staz Software, and many of my projects involve talking to a serial device that gathers information and/or controls things. One of my long running projects has been writing both the data collection and the analysis software for the M-Mat project that is being run by the Development Biopsychiatry Research Program at McLean Hospital (see the program's main window on left). Another medical project has been writing data collection and analysis software for drug research projects being run by the Behavioral Psychopharmacology Research Laboratory at McLean Hospital. I have also written several pieces of educational software for TERC, a Chrononomy program for calculating 'Halachic Times', many programs to gather data or to control equipment, as well as the countless utilities and the tools necessary to support all of this. I have also learned enough about the FileMaker Pro database program to be able to design and maintain mailing lists for several organizations and individuals.